Back in March, after a 15-hour sail from Acapulco to a small fishing village, we drop the hook and set up the boat for being at anchor for the night. For some boaters, this means tidying up lines, covering sails, doing dishes, cleaning the cockpit and perhaps taking a nap. For us, a cruising sailboat with two children aboard, it means getting set up to play before darkness sets in. It still amazes me that on such a small space we can create as much opportunity for play as we do on our 1+ acres of land at home in Anchorage. I thought I would try to describe our kid-centered home afloat. When we come to anchor, one of the first things that often happens is Carmen helps rig her favorite swinging rope off the end of the boom for tarzan-style swinging into the water. Meanwhile, Bruce and I share a cold beer before before launching our kayak and paddling around the quiet bay. 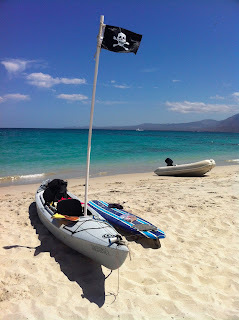 Richard often gets to work setting up a hammock to read in or launching the dinghy from which he plans to "dinghy surf." This particular afternoon, upon returning from a short sunset paddle, I look at the good ship Northern Passage and started to giggle - "Look at us, Bruce! We are so obviously a cruiser with kids!" One image you might have of sea-going sailboats is of pristine, shiny white, glistening chrome and polished wood "yachts." Such boats do exist, however in my experience, these boats are not the "cruisers," at least not the cruisers with kids aboard. "Kid Cruisers" are lived in for months or years at a time and tend to spend as little time at docks as possible. 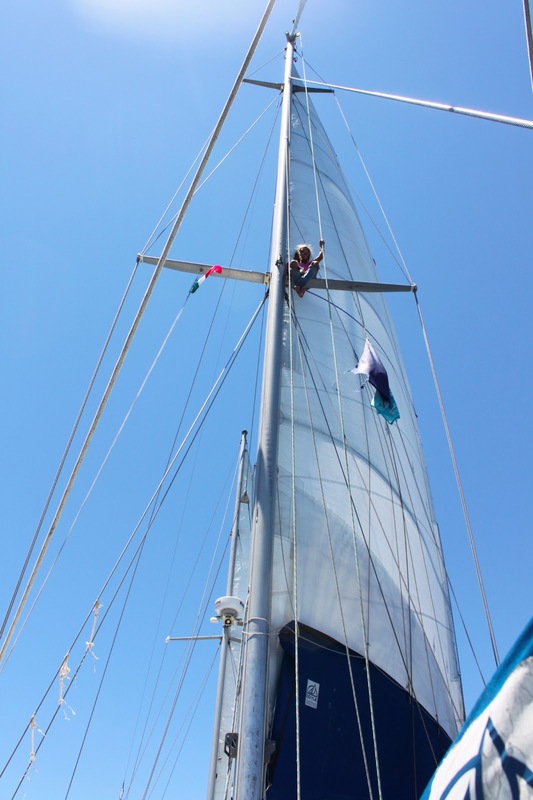 Generally, we go to marinas to fuel up, wash down the boat, do repairs, fill our tanks with water, go grocery shopping, and perhaps take a long hot shower ashore, but we don't spend most of our time there. We spend most of our time sailing or at anchor. Our boats often have a, well, sort of "lived-in" family look. S/V Northern Passage looks very much like our land-based home and yard used to look. Busy. Messy. Lived-in. 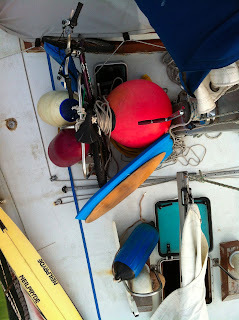 Davits on the stern serve as our "garage" for our "car" - the dinghy. Notice the stuff stored inside - just like my van at home! 1) TOYS ON DECK AND CHILDREN ON RIGGING: Recreational toys on a cruising sailboat serve important functions: they are our transportation to shore and on shore, plus our means to play in the sun and get those sillies out after long passages at sea. Many kid cruisers tend to have an abundance of toys strapped to the deck of their boats, as four or more people sometimes need to play at once. Our dinghy (the closest thing to a "car" that we own) hangs from davits off the stern while a paddleboard, surfboard, boogie board, rip stick and skimboard are strapped to the rail; two bicycles are on deck while two more are stowed below in our shower/"storage shed." Parts of the rigging of a windsurfer also line the rails, just in case we ever run across the other bits and pieces we need to make yet another complete toy. Fenders are often dangling off the rail as they make for good toys or climbing apparatus. Snorkels and fins are almost always strewn about the back deck. Above decks, the entire boat is a junglegym. It is typical to see children hanging from stays, sitting on spreaders, lounging on booms, swinging from davits. Dinghy, kayak, paddleboard get everyone ashore. 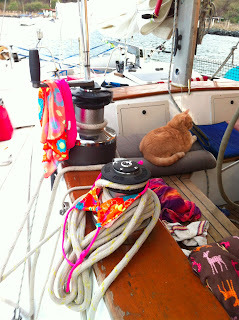 monkey toes up a halyard to sit on the spreader! 2) SHADE-MAKERS: Since it is almost always hot and sunny in the tropics, those who live aboard have to create shade however possible. Until about four months ago, our awnings were blankets and towels hung in strategic locations from the boom and stays. 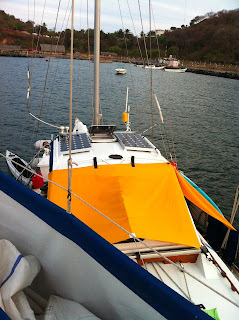 However, in Zihuatanejo I bought a roll of canvas, set up the sewing machine and designed and sewed "proper" awnings. Still a bit home-made looking, they have made life in the hot sun much more bearable. And they keep fragile children's skin from burning to a crisp! 3) BOOKS: Belowdecks, many cruisers' boats are filled to capacity with books. This is especially true with boat-schooling kids aboard. Our books are crammed into every available space. There are also legos, stuffed animals, board games, craft and art supplies in every nook and cranny. 4) CREATIVE REPAIRS: Many cruising sailboats flaunt evidence of home-done repairs, as supplies are often few and far between so we must become creative and adaptable. On our steel boat, chipped paint gets covered with special rust-proofing paint that we call "duct tape paint" because of its silvery grey color. The spigot for our washdown hose, long ago broken off, has been a pair of pliers for the past 9 months. Until we get the fiberglassing materials out, duct tape serves to protect the dinks and holes in our paddleboard. 5) CREATIVE TOWEL AND CLOTHES DRYING RACKS: Winches are large gears with handles attached that help us crank in sails under tension. They also make excellent clothing and bathing suit dryers, and while at anchor our winches are typically covered with such items as hats, bikinis and swim shirts. Towels get draped over booms and along lifelines. 6) COCKPITS FULL OF STUFF: It is a losing battle to get STUFF out of the cockpit. The cockpit is kind of like the kitchen or den in a house - it is where we hang out most of the time we are on board, the place where we bring food and drinks and books and pens and paper and knives and shoes, pillows, blankets, clothing, bathing suits, sunblock. After a day of collecting shells and rocks along a beach, the cockpit table is where the treasures are displayed. It is the heart of our floating home. 7) NOISY: A cruising sailboat with kids is not a quiet, serene place. Especially when more than one kid-cruiser are at anchor, the harbor is filled with splashing, laughing, shouting kids. On board, there are sibling battles being fought and laugh out loud movies being watched. I wonder if the cruisers who arrive at an otherwise pristine anchorage turn around when they see a cruising boat with kids anchored up. So much for a peaceful evening with nature! All this said, I am sure there are neat and tidy kid cruising sailboats on the sea also. Our boat is just not one of them. As we get ready to return to land, at least for the next year or so, I wonder why we need so much space there, when we can fully entertain ourselves aboard our 51' long, 14' wide (at the center) floating home. It happened again - I've been off the grid long enough that I lost time. A few days ago I awoke to songbirds and the tinkling bells of a goat heard meandering across high seaside dessert mountains. I had a vague sense that it was May, but other than that I didn't know the day of the week or the date. So I suppose a more accurate description is that I lost my sense of the Gregorian calendar. Really, I knew just about exactly what time it was, based on the placement of the sun in the sky. It was 7:30am. I also knew that it was a new moon because I see the moon change every day, I watch the tides change, and experience my monthly cycle matching this primal rhythm. But the day? The date? Not so sure. The mountainous islands north of La Paz in the Sea of Cortez's west coast (the East side of Baja California, Mexico) are pleasantly and surprisingly remote. I long ago abandoned wearing a wristwatch, so my days flow with the sun, the tides, wind and weather. Without internet or cell phones marking my time, I only become aware of the day and date on the occasions (about once a week) when we check in to a local VHF net or are able to download an email from our SSB radio connection. -- Most VHF radios have line of sight range or roughly 25 miles. This can be greater with a beefier antenna. -- Channel 16 is reserved for hailing and important information or rescue efforts. Other channels are used for various functions, depending on the part of the world where you are located. -- There is a strict "radio etiquette" used that is not only expected but actually legally required in some countries. For example, it is a BIG no-no to chat with another boat on Channel 16. What one does is HAIL another boat by calling their name three times, followed by one's own boat name. Once contact is made, both parties agree to switch to a different channel reserved for longer conversations. -- All stations are public. Just like the old party lines, or even before that, when the first telephones involved an operator who would connect you to each other. Your conversation could be heard by everyone in town with a phone, anyone could "follow" your conversation. Same goes for VHF chatting. -- In the cruiser's world, here in Mexico and other places where cruisers gather, there are often "morning nets" on designated VHF channels. These are places where boaters "check in" and receive local information. After spending weeks in remote areas, it is fun to check in to a local net upon arrival at a port and hear that friends you had met months ago are in the same town. It is really like a cruiser's facebook, a social network where people ask for rides to and from places, sell and purchase items, learn about music and social events, and catch up with each other. Most nets occur once a day every day, so there really is no need to know which day of the week it is! The SSB radio is a Single Side-Band Radio. A license is required to use it, and some channels require a ham radio license to transmit although most all stations can be listened to. This is an incredible tool. -- Its range reaches around the globe. One can sometimes pick up conversations in Russia or Japan or New Zealand. When off-shore it is the only way to communicate with people further away from your VHF radio (which is usually everyone). -- These radio frequencies can now be used like a dial-up modem of the old PC days, and that is how I am sending this email today. -- Things like solar flares affect the ability to use these radio frequencies, and there are long lists of pre-scheduled nets across the world. This is a reassuring tool that gives ocean-crossing cruisers security that they can reach someone if needed, and gives land-based cruisers like us a way to send and receive basic emails when wifi or cell is not an option. -- There are even stricter rules about using the SSB frequencies than the VHF, as it is like the old days of dial-up modems - while one person is using it, NO ONE ELSE may use it so messages are kept short and sweet. Which reminds me, this message is getting way too long and I don't wish to become a bandwidth hog, so I am going to cut this short. The reason there are not photos included with this update is because of this SSB radio connection. So, embracing the technology of old, I send love and well wishes to all I know back home and I hope you have a slightly better understanding now about why our communication is so sporadic. We are healthy and happy playing around this magical world of snorkeling, diving, dinghy sailing, hiking, resting in hammocks and connecting with new friends. Our months at sea are winding down to a few more weeks, so we treasure every moment. S/V Northern Passage will be put on land in a few weeks, and our "yacht" will become a land-yacht with four wheels and engine traveling all over the continental U.S. before returning to Alaska in August.